OPDI is planning a training program in Toronto for March 18 – 22, 2019. If interested, please email opdi@opdi.org. Full details will be posted on our website. The link is https://www.opdi.org/news-events/events/training/opdi-peer-support-core-essentials-training-program-toronto. Deadline for registration is March 1st, 2019. Please note: this training requires a minimum of 10 participants to run. The next (optional) Training Expectations Webinar will be February 13th from 12:00pm – 1:00pm. If you are interested in learning more about OPDI Peer Support Training, please email opdi@opdi.org for more information and login information. Ion scanners cause stress for families of prisoners, research shows. Electroconvulsive therapy or ECT, better known as shock treatment, is still considered the go-to treatment but comes with the common side effect of memory loss. So doctors are now exploring less invasive experimental approaches like brain stimulation that rewires the brain's circuits. "Hard-to-treat depression is a huge public health problem" says Dr. Jeff Daskalakis of Toronto, at the Centre for Addiction and Mental Health's Temerty Centre for therapeutic brain intervention. "The idea that we have treatments that could potentially rectify or improve their illness can be very reassuring to patients." Like reading a great novel, virtual reality can be a totally immersive experience. It can put you in a new place and make you feel, for a period of time, like a different person. And that can have a powerful effect on your emotional state. So what happens if we use it, with purpose, to change how we feel? Metro Morning: We're continuing our series looking at society's relationship with alcohol, and the many reasons people give it up. Today, David McMillan, the chef, wine-maker, and co-founder of the renowned Joe Beef restaurant in Montreal. We speak with him about why he's drawing awareness to addiction issues in kitchens and beyond -- all the while serving up a substance he himself won't touch. Can our genetic markers or an MRI of our brain predict suicide? What defines suicidal behaviour? Is there merit to all those "black box warnings? Researchers at the University of Washington have developed a cellphone app that uses sonar to monitor someone's breathing rate and sense when an opioid overdose has occurred. The Ontario Housing First Regional Network Community of Interest (OHFRN-CoI) is excited to host our 2nd annual Housing First (HF) forum for stakeholders from across Ontario to come together to share resources and experiences with implementing HF in their communities. Please share widely with your networks. This event is taking place on Friday March 8, 2019 from 9am – 4pm, in Toronto, with a keynote presentation from Dr. Vicky Stergiopoulos, Clinician Scientist and Physician-in-Chief, CAMH, discussing the long-term follow-up of the Toronto At Home programs. A number of concurrent sessions on topics related to HF will also be included. 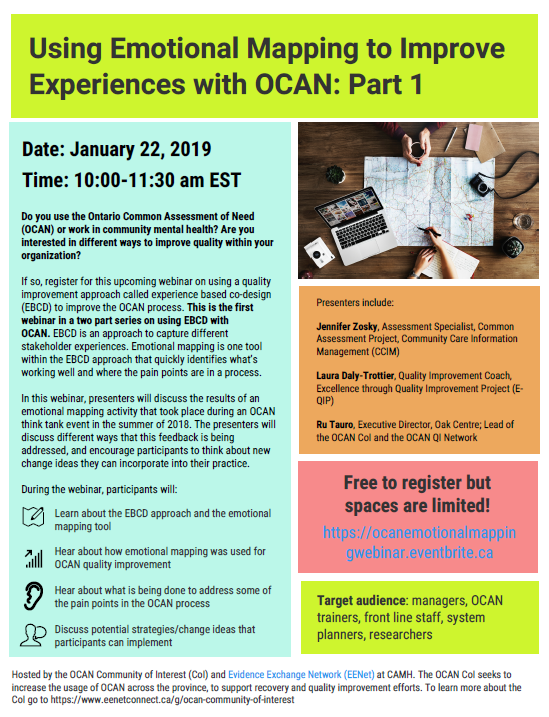 For more information and to register, visit: http://www.eenet.ca/article/2019-housing-first-forum-evidence-based-practices. Please also have a look at a policy brief released by the OHFRN-CoI on Assertive Community Treamtment (ACT) and HF, as well as a letter that was just submitted to Ministers Elliott and Clark on the topic. We are now accepting proposals for the 41st Guelph Sexuality Conference. This year's theme is Redefining Relationships & Sexual Health - June 20-21, 2019.
how attendees navigate social, political, and professional systems. encourage attendees to consider new ideas, practices, and research. spark interest and inspire new areas of exploration for attendees. Visit www.GuelphSexualityConference.ca to submit your proposal by January 15, 2019. The Centre for Innovation in Peer Support is pleased to announce another Online Peer Staff Supervisors Training opportunity for three, 2 hour sessions January 22-24 daily from noon until 2 pm ET. OPDI is working in alliance with the Centre for Innovation in Peer Support and serves on the Stewardship Group. OCAN. EBCD is an approach to capture different stakeholder experiences. Emotional mapping is one tool within the EBCD approach that quickly identifies what’s working well and where the pain points are in a process. To subscribe to this e-mail update, fill out our secure sign up form or e-mail opdi@opdi.org. Like us on Facebook. Follow us on Twitter. You will find more interesting stories there that we couldn't fit in NewsToGo. NewsToGo is OPDI’s e-mail update providing timely and meaningful information to its stakeholders. The ideas expressed are those of the individual contributors and do not necessarily reflect the views and opinions of OPDI. We welcome your submissions; please direct them to opdi@opdi.org. Preference will be given to material which directly relates to OPDI member affiliates and issues of concern to consumer/survivors throughout Ontario. We reserve the right to edit the length and style of all materials submitted. The current and back issues of NewsToGo can be found at http://www.opdi.org.